The HMV portable model 100 appeared in June 1924. It was cheaper and more compact than the previous models P.B.O. or P.B.C. (105) and had some new features. 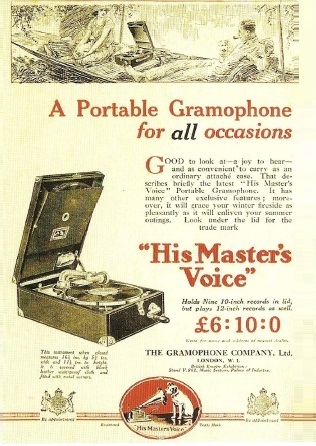 The model 100 was the predecessor of the well known model 101, which was at all the most succesful portable gramophone. The HMV portable model 100 came 1924 on the market. It was cheaper and more compact than the previous models P.B.O. or P.B.C. 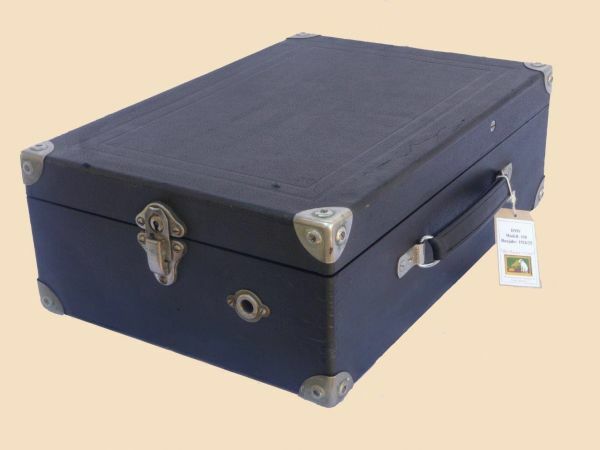 (105) in which to save space, the motor board was lowered into the case. 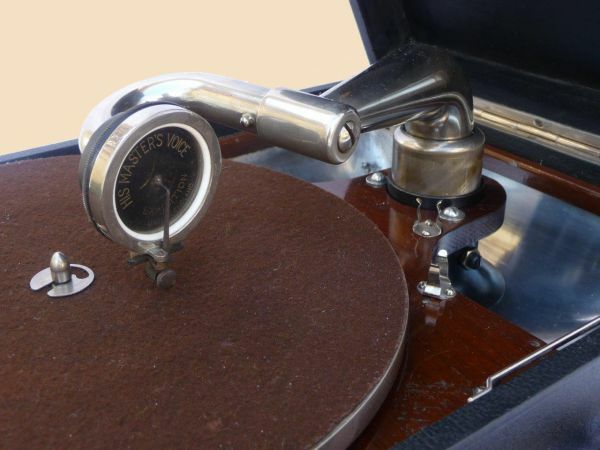 With the model 100 HMV took an other solution and installed a retractable tonearm. The tonearm rose to the playing position when moved to the right. When the machine was closed, the tonearm sat in the sound well in its lower postion. Thus, and through the new motor the height of the case could be significantly reduced. Also a new feature was the simple and relatively short horn that reflects the sound directly against the lid. It was made of aluminum and had a polished surface. 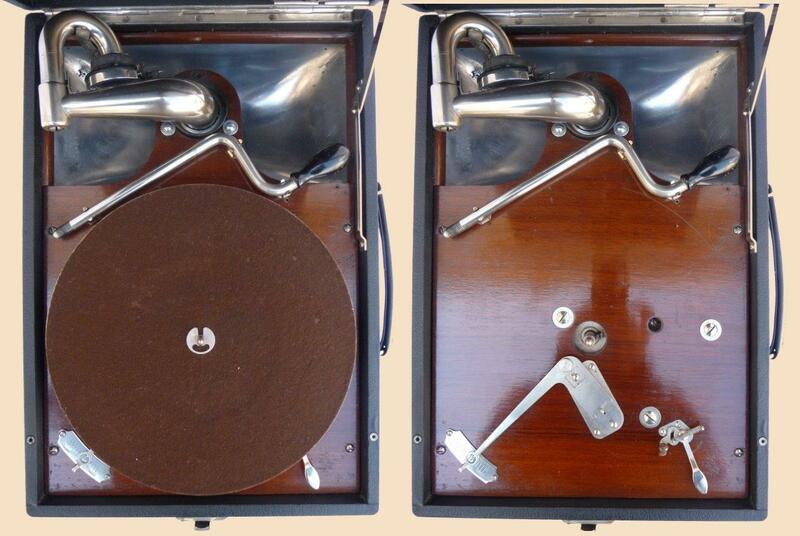 Also, the record pocket in the lid of the case was an innovation. The Model 100 had new designed horizontal single-spring-motor of the type 400, which had to be mounted frontally. The crank was unfavorably dimensioned that the motor could not be winded up while it was standing on a table. However, this was changed until the later model 101 from variant "C". Total 6,798 machines were sold in Britain. The Model 100 has been developed very quickly due to its commercial success and so the model 101 was produced from October 1925. 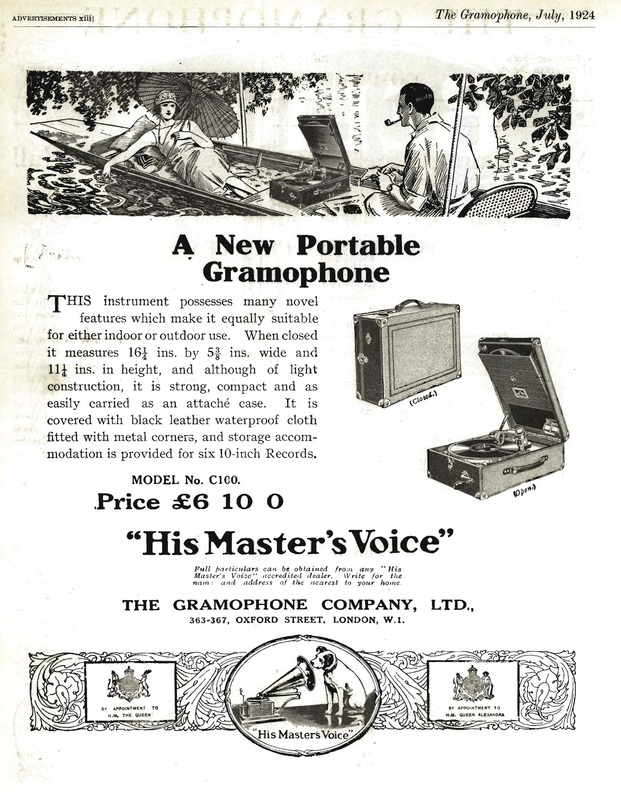 According to the sales figures the model 101 was the most successful gramophone made by the Gramophone Company. Das Koffermodell 100 von HMV kam 1924 auf den Markt. Es war günstiger und auch kompakter als die Vorgängermodelle P.B.O. oder P.B.C. (105), bei welchen zur Platzersparnis das Motorboard in das Gehäuse abgesenkt wurde. Beim Modell 100 ging man einen anderen Weg und installierte einen versenkbaren Tonarm. Die Tonarmhalterung war so konzipiert, dass sich der Tonarm beim bewegen in Abspielposition automatisch aus dem Trichter nach oben hob. Somit und durch den neuen Motor konnte die Deckelhöhe von Anfang an gering gehalten und somit die gesamte Kofferhöhe signifikant reduziert werden. Neu war auch der einfache und vergleichsweise kurze Trichter der den Ton direkt gegen den Deckel reflektierte. Dieser war aus Aluminium und hatte eine polierte Oberfläche. Auch das Plattenfach im Deckel des Koffers war eine Neuerung. Das Modell 100 hatte einen neuartigen horizontal gelagerten Einfeder-Motor des Typs 400, der frontal aufgezogen werden musste. Die Kurbel war ungünstig dimensioniert, dass der Koffer nicht einem Tisch stehend aufgezogen werden konnte. Dies wurde jedoch erst im weiteren Verlauf des Modells 101 ab Variante „C“ verändert. Insgesamt wurden vom Modell 100 6.798 Stück verkauft. 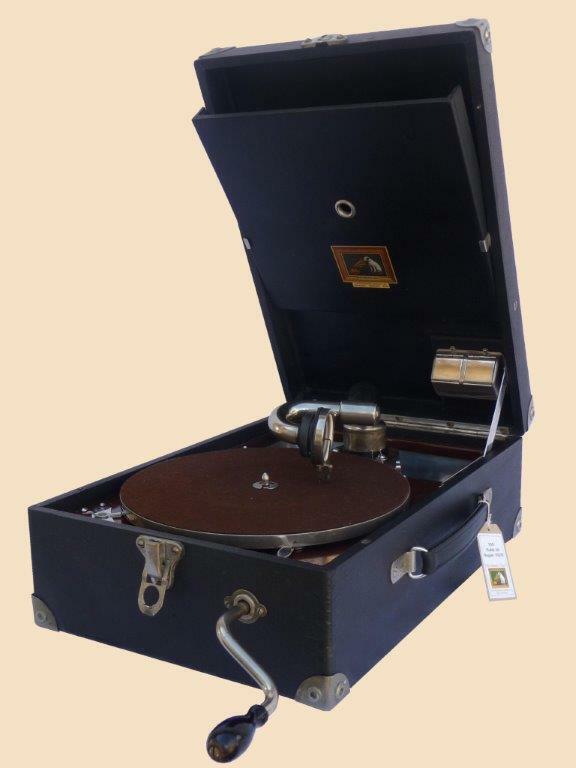 Das Modell 100 wurde auf Grund seines kommerziellen Erfolges sehr schnell weiterentwickelt und so entstand ab 1925 das Modell 101, welches den Verkaufzahlen nach das erfolgreichste Grammophon der Gramophone Company wurde. The model 100 doesn´t has any autobreak. The winding handle clips on the model 100 and the front wind-101s were not well postioned and it´s unusual to find all three complete. 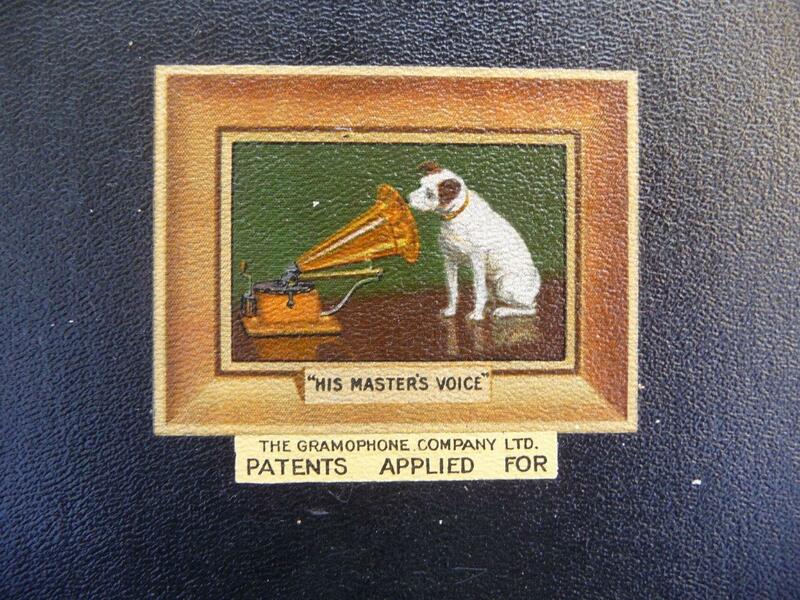 The machine is fitted with the late HMV Exhibition soundbox. Furthermore it has the needle container on the right side of the lid. It is the same like the first version of the model 101 has, but on the 101 it is located on the left side. Early versions of that model only had a thick framed decals without the addition "Patents applied for"